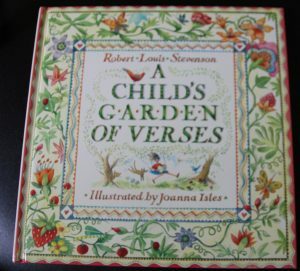 This beautiful book of children’s poetry, another I found at the bookstore in Port Moody, was originally published in 1885 and “reflects a Scottish poet’s vision of the Victorian world.” Illustrated by Joanna Isles (from a 1994 reprint), A Child’s Garden of Verses, with dozens of poems, is exploding with old-time colorful splashes and happiness, with pictures of butterflies and flowers, and wild things that lurk about the natural world. The art and poetry also reflect cultural diversity and history. I still have a childhood book; I remember (brother) Jerry [my dad!] reading to me: “I have a little shadow who goes in and out with me, and what can be the use of him is more than I can see…” The name of the book was “A Child’s Garden of Verses.” It is packed with books that are going to Kentucky with us when we move. Reading is always on my list of hobbies. It’s what I do for relaxation, even if it happens to be a murder mystery! I’m glad Mother and Jerry read to me.